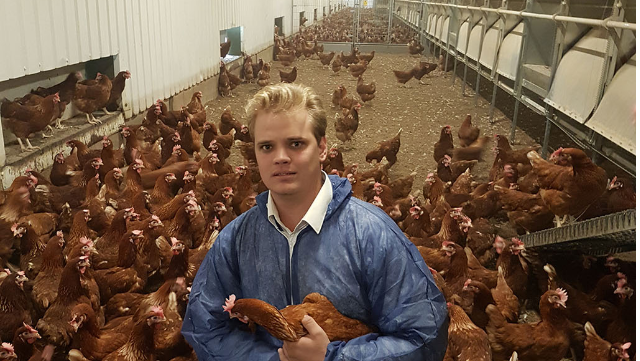 Matthew Oldnall, 28, is a poultry specialist at Massey Feeds, currently studying a postgraduate diploma in poultry production at Harper Adams University. He also spent time in South Africa at the University of Pretoria studying animal science. Day-to-day: When sitting down to write this article, I firstly wanted to say I hope everyone had a fantastic festive period. I spent Christmas down in beautiful Pembrokeshire before travelling back up for the fantastic nightlife of Chester for New Year’s Eve. Thinking about my own working life, I realise how fortunate we are within the agricultural industry that no day is ever the same. Poultry is, for me, by far the most diverse and forward-thinking industry with the most interesting people I have ever met. It also has the bonus of allowing me to see the world, and it was after growing up and undertaking my primary studies in South Africa that I developed a love for the industry. I was fortunate enough to follow that up by moving to rural Zimbabwe to work on an EU-funded programme using broilers and broiler meat as a way of increasing rural household income and the economic status of the surrounding area, while decreasing hunger. Passion: This only fuelled my passion for the industry and, upon acceptance to the Harper Adams masters programme, I moved to the UK working for one of the world’s most technologically progressive broiler producers and advisers. This was followed by running the poultry department for an industryleading free-range and organic production company, before joining Massey Feeds. The industry’s opportunities are exciting, especially as it has positive projected growth to 2030. Technology: My personal career quest and current thesis topic is to improve carcase utilisation by consumers and thereby reduce food wastage. My main focus is to always be a technical aid to all my customers, ensuring I add value to every farm I encounter. This could mean anything from helping the farmer build a supply chain to data collection and problem solving to maximise profitable production. Our latest work focuses on how best to nutritionally ensure the birds cope with the changing requirements of the layer industry with the requirement for extended laying beyond the standard 72 weeks and also ensuring market demands for larger-sized eggs are met.